Eric Sylvain Abidal (French pronunciation: ​ [eʁik abidal] ; born 11 September 1979) is a French former professional footballer who played as a left back or a central defender, and is the director of football of FC Barcelona. A director of football is a senior management figure at an association football team most commonly in Europe. The exact nature of the role is often unclear and causes much debate in the sports media. Olympique Lyonnais, commonly referred to as simply Lyon or OL, is a French football club based in Lyon. It plays in France's highest football division, Ligue 1. 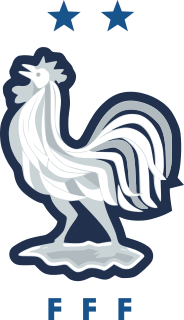 The club was formed as Lyon Olympique Universitaire in 1899, according to many supporters and sport historians, but was nationally established as a club in 1950. The club's most successful period has been the 21st century. The club won its first Ligue 1 championship in 2002, starting a national record-setting streak of seven successive titles. Lyon has also won a record seven Trophée des Champions, five Coupe de France titles and three Ligue 2 titles. Born in Saint-Genis-Laval, Lyon Metropolis, Abidal started playing with AS Lyon Duchère, an amateur team in the suburbs. He started his professional career with AS Monaco FC,  making his Ligue 1 debut on 16 September 2000 in a 3–0 home win against Toulouse FC but only appearing in 22 league matches over the course of two full seasons. Saint-Genis-Laval is a commune in the metropolis of Lyon in the Auvergne-Rhône-Alpes region of eastern France. Metropolitan Lyon, also known as Grand Lyon, is a French territorial collectivity located in the east-central region of Auvergne-Rhône-Alpes. Encompassing the city of Lyon and most of its suburbs, it has jurisdiction as both a department and a métropole, taking the territory out of the purview of the department of Rhône. 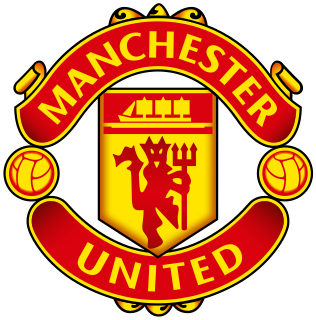 Association sportive de Monaco football club, commonly referred to as AS Monaco or Monaco, is a Monégasque football club that competes in Ligue 1, the top tier of French football. Founded in 1924, the team plays its home matches at the Stade Louis II in Fontvieille. The club is coached by Leonardo Jardim and captained by Radamel Falcao. LOSC Lille is a French association football club based in Lille. The club was founded in 1944 as a result of a merger and play in Ligue 1, the first division of French football. Lille has played its home matches since 2012 at Stade Pierre-Mauroy in nearby Villeneuve d'Ascq, which replaced the club's previous home of Stade Lille-Metropole in the same community. 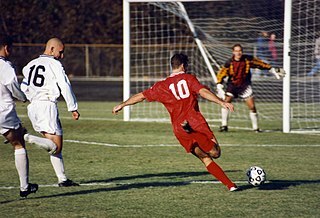 For the 2002–03 season, the French Division 1 was renamed as Ligue 1 and was expanded to contain 20 clubs, which played 38 matches against each other, rather than the 34 matches in previous seasons. Lyon won the 2002–03 Ligue 1 season of the French Association Football League with 68 points. Claude Jacques Puel is a French football manager and former player. He spent his entire playing career with AS Monaco, before becoming manager of the club, leading them to the league title in his first full season in charge. He has also managed Lille, Lyon, Nice, Southampton, and Leicester City. 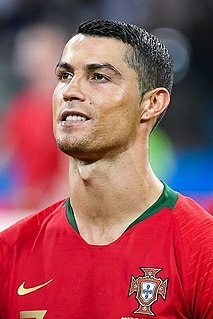 Cristiano Ronaldo dos Santos AveiroGOIH ComM is a Portuguese professional footballer who plays as a forward for Italian club Juventus and captains the Portugal national team. Often considered the best player in the world and widely regarded as one of the greatest players of all time, Ronaldo has a record-tying five Ballon d'Or awards, the most for a European player, and is the first player to win four European Golden Shoes. He has won 28 trophies in his career, including six league titles, five UEFA Champions League titles and one UEFA European Championship. A prolific goalscorer, Ronaldo holds the records for most official goals scored in the UEFA Champions League (126), the UEFA European Championship (9), as well as those for most assists in the UEFA Champions League (34) and the UEFA European Championship (6). He has scored over 700 senior career goals for club and country. François Jacques Clerc is a French retired footballer who played as a right back. Abidal missed the first months of the 2005–06 campaign after fracturing his metatarsus in a friendly game with Once Caldas. He still managed to appear in 15 matches as Lyon won its fifth national championship in a row  (the second with the player). Thierry Daniel Henry is a French professional football coach and former player who was most recently the manager of Ligue 1 club Monaco. Carles Puyol Saforcada is a Spanish retired professional footballer who played his entire career for Barcelona. Mainly a central defender, he could also play on either flank, mostly as a right-back, and is regarded as one of the best defenders of his generation. Ludovic Vincent Giuly is a French former footballer who played as a winger. Seydou Keïta is a Malian former footballer. A versatile midfielder, he operated as both a central or defensive midfielder. Anderson da Silva, known as Sonny or Anderson, is a Brazilian retired footballer who played as a striker. Daniel Alves da Silva, commonly known as Dani Alves, is a Brazilian professional footballer who plays as a right back for French club Paris Saint-Germain and the Brazil national team. Patrice Latyr Evra is a French professional footballer who most recently played for English club West Ham United and has represented the France national team. Originally an attacker, he primarily plays as a left-back. Evra, whom Sir Alex Ferguson praised for his leadership, also describing him as one of the best left-backs in Europe, has served as captain for both Manchester United and France. Adriano Correia Claro, known simply as Adriano, is a Brazilian professional footballer who plays for Turkish club Beşiktaş J.K.. One of few players in professional football who are genuinely ambidextrous, he is capable of playing as a defender or midfielder, on both sides of the pitch. José Manuel Pinto Colorado is a Spanish retired professional footballer who played as a goalkeeper. Raúl García Escudero is a Spanish professional footballer who plays for Athletic Bilbao mainly as an attacking midfielder but also as a central midfielder, known for scoring from the bench and having good aerial ability. Jeffrén Isaac Suárez Bermúdez, known simply as Jeffrén, is a Venezuelan footballer who plays for AEK Larnaca as a forward or winger. Andreu Fontàs Prat is a Spanish professional footballer who plays as a central defender for North American club Sporting Kansas City. Jordi Alba Ramos is a Spanish professional footballer who plays as a left-back for Barcelona and the Spain national team. Marc Bartra Aregall is a Spanish professional footballer who plays as a centre-back for Real Betis and the Spain national team. The 2010–11 season was Futbol Club Barcelona's 111th in existence and the club's 80th consecutive season in the top flight of Spanish football. Barcelona started the season with a new president after Joan Laporta reached his term limit on 30 June, leaving behind a very successful club tenure. Cristian Tello Herrera is a Spanish professional footballer who plays as a forward or winger for Real Betis. The 2011 UEFA Super Cup was the 36th UEFA Super Cup, between the reigning champions of the two club competitions organised by the European football governing body UEFA: the UEFA Champions League and the UEFA Europa League. It took place at the Stade Louis II in Monaco on 26 August 2011. It was contested by the 2010–11 UEFA Champions League winners Barcelona of Spain and the 2010–11 UEFA Europa League winners Porto of Portugal. Barcelona won the title defeating Porto 2–0. Joan Isaac Cuenca López is a Spanish professional footballer who plays as a winger for Japanese club Sagan Tosu. Pedro Eliezer Rodríguez Ledesma, known as Pedro, is a Spanish professional footballer who plays as a forward or winger for Premier League club Chelsea and the Spain national team. Samuel Yves Umtiti is a French professional footballer who plays as a centre-back for Spanish club Barcelona and the French national team. He is considered the world's most expensive centre-back from a transfer value perspective by the CIES. ↑ "FIFA World Cup South Africa 2010: List of players: France" (PDF). FIFA. 4 June 2010. p. 10. Retrieved 26 January 2019. 1 2 "Graft not glitz defines Abidal's Monaco memories". UEFA. 24 August 2011. Archived from the original on 23 October 2013. Retrieved 10 November 2012. 1 2 "Barcelona star Abidal returns to training after liver transplant". CNN. 10 October 2012. Retrieved 10 November 2012. 1 2 "French Focus: Eric Abidal (Lyon)". Channel 4 . Retrieved 9 October 2007. ↑ "Milan 3–1 Lyon (Agg: 3–1)". The Guardian . 4 April 2006. Retrieved 10 November 2012. ↑ "Roma 0–0 Lyon". BBC Sport. 21 February 2007. Retrieved 10 November 2012. ↑ "Abidal punishment". UEFA. 19 November 2004. Retrieved 19 September 2012. ↑ "Lyon learn worst about Abidal". UEFA. 25 July 2005. Retrieved 19 September 2012. ↑ "Bordeaux slip gives Lyon fifth straight title". The Guardian. 17 April 2006. Retrieved 10 November 2012. ↑ "Abidal joins Barcelona". FIFA. 29 June 2007. Retrieved 30 July 2007. ↑ "The first squad list". FC Barcelona. 25 August 2007. Retrieved 10 November 2012. ↑ "`Fantastic Four' fail to fire for Barca". The Standard . 28 August 2007. Archived from the original on 23 October 2013. Retrieved 10 November 2012. ↑ "Murcia 3–5 Barcelona: Dos Santos hits treble". ESPN Soccernet. 17 May 2008. Retrieved 10 November 2012. ↑ "Iniesta's late heartbreaker". ESPN Soccernet. 6 May 2009. Retrieved 10 June 2012. ↑ "Llorente the party pooper". ESPN Soccernet. 10 May 2009. Retrieved 10 June 2012. ↑ "One title closer to the treble". ESPN Soccernet. 14 May 2009. Retrieved 10 November 2012. ↑ "Guardiola praises Barca bravery". BBC Sport. 26 May 2009. Retrieved 10 November 2012. ↑ "Sin magia también se puede en San Mamés" [Magic not needed in San Mamés]. El Mundo (in Spanish). 6 January 2011. Retrieved 10 June 2012. ↑ "Barca fight back at the Bernabeu". ESPN Soccernet. 18 January 2012. Retrieved 10 June 2012. ↑ "Abidal, hasta 2013: "Quiero seguir haciendo historia"" [Abidal, until 2013: "I want to continue making history"]. Diario AS (in Spanish). 3 February 2012. Retrieved 10 June 2012. ↑ "Abidal: "I'm going and I'll definitely be back"". FC Barcelona. 29 May 2013. Retrieved 30 May 2013. ↑ "Barcelona release Eric Abidal after his return from liver transplant". The Guardian. 30 May 2013. Retrieved 30 May 2013. ↑ "Eric Abidal to undergo surgery after Barcelona full-back diagnosed with a liver tumour". Daily Mail . 16 March 2011. Retrieved 10 November 2012. ↑ "Abidal diagnosed with tumour on liver". FC Barcelona. 15 March 2011. Archived from the original on 2 August 2012. Retrieved 16 March 2011. ↑ "Barca's Abidal set for surgery on tumour". ESPN Soccernet. 15 March 2011. Retrieved 16 March 2011. ↑ "El mundo del deporte se vuelca con Abidal" [Sports world supports Abidal]. Mundo Deportivo (in Spanish). 18 March 2011. Retrieved 18 March 2011. ↑ "'Ánimo Abidal', mensaje de ánimo en el Bernabéu" ['Ánimo Abidal', message of support at the Bernabéu]. Marca (in Spanish). 16 March 2011. Retrieved 16 March 2011. ↑ "Abidal still climbing mountains as France face Spain". Yahoo Sports. 16 October 2012. Archived from the original on 19 October 2012. Retrieved 10 November 2012. ↑ "Eric Abidal looks for a repeat of heart-warming recovery as football family comes together again". The Independent . 3 April 2012. Archived from the original on 12 October 2012. Retrieved 10 November 2012. ↑ "Abidal lifts the 4th trophy". FC Barcelona. 26 May 2011. Retrieved 10 June 2012. ↑ "Barcelona defender Eric Abidal to have a liver transplant". BBC Sport. 15 March 2012. Retrieved 15 March 2012. ↑ "Barcelona defender Eric Abidal recovering well after liver transplant surgery". The Daily Telegraph . 11 April 2012. Retrieved 15 November 2012. ↑ "Barcelona dedicate win to Abidal". ESPN Soccernet. 11 April 2012. Retrieved 11 April 2012. ↑ "Guardiola dedicates Getafe win to Eric Abidal". Xinhua News Agency. 11 April 2012. Retrieved 10 November 2012. ↑ "Eric Abidal says Dani Alves offered him part of his liver for transplant". The Guardian. 16 September 2013. Retrieved 28 May 2014. ↑ "Abidal could play on". The Sun . 1 June 2012. Retrieved 4 June 2012. 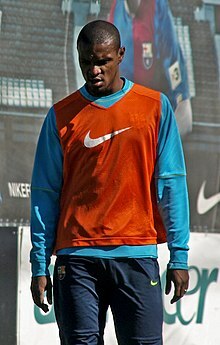 ↑ "Barcelona defender Eric Abidal has begun training again following his liver transplant earlier this year". Sky Sports. 10 October 2012. Retrieved 9 November 2012. ↑ "Abidal: Returning to football not my objective". Goal. 6 November 2012. Retrieved 15 November 2012. ↑ "Barcelona's Abidal given the green light to play football again". Goal. 18 December 2012. Retrieved 18 December 2012. ↑ "Éric Abidal plays practice match against Istres". FC Barcelona. 19 March 2013. Retrieved 13 May 2014. ↑ "Fabregas fires Barca to victory". ESPN FC. 6 April 2013. Retrieved 7 April 2013. ↑ "Abidal: "Gracias a mi primo, sin él no estaría aquí"" [Abidal: "Thanks to my cousin, i would not be here without him"]. Marca (in Spanish). 7 April 2013. Retrieved 7 April 2013. ↑ "Below-par Barca leave it late". ESPN FC. 20 April 2013. Retrieved 22 April 2013. ↑ "Le retour d'Eric Abidal" [The return of Eric Abidal] (in French). AS Monaco. 8 July 2013. Archived from the original on 8 July 2013. Retrieved 10 July 2013. ↑ "Abidal seguirá un año más en el Mónaco" [Abidal to continue one more year with Monaco]. Sport (in Spanish). 3 June 2014. Retrieved 27 July 2014. ↑ "Eric Abidal leaves Monaco for Olympiakos". BBC Sport. 5 July 2014. Retrieved 6 July 2014. ↑ "Former Barcelona and France defender Eric Abidal announces retirement from football". Daily Mail. 19 December 2014. Retrieved 19 December 2014. ↑ "Soccer-Abidal Returns to Barcelona as sporting director". The New York Times . 7 June 2018. Retrieved 15 June 2018. ↑ Gallagher, Danny (19 June 2018). "Eric Abidal returns to Barcelona as sporting director". Sky Sports. Retrieved 20 June 2018. 1 2 "French football federation invite Abidal as guest for Sweden clash". Goal. 13 June 2012. Retrieved 9 November 2012. ↑ "Togo 0–2 France – Stats/action". BBC Sport. 23 June 2006. Retrieved 9 November 2012. ↑ "France 0–0 Switzerland". BBC Sport. 13 June 2006. Retrieved 9 November 2012. ↑ "France 1–1 South Korea". BBC Sport. 18 June 2006. Retrieved 9 November 2012. ↑ "Italy 1–1 France (aet)". BBC Sport. 9 July 2006. Retrieved 9 November 2012. ↑ "France 0–2 Italy". BBC Sport. 17 June 2008. Retrieved 9 November 2012. ↑ "World Cup 2010: Uruguay v France – as it happened". The Guardian. 11 June 2010. Retrieved 9 November 2012. ↑ "France v Mexico: as it happened". The Daily Telegraph. 17 June 2010. Retrieved 9 November 2012. ↑ "World Cup 2010: Eric Abidal chose not to play against South Africa – France coach Raymond Domenech". Goal. 22 June 2010. Retrieved 9 November 2012. ↑ "World Cup 2010: South Africa beat red-faced France and both bow out". The Guardian. 22 June 2010. Retrieved 9 November 2012. ↑ "Éric Abidal" (in Spanish). FC Barcelona. Retrieved 21 January 2015. ↑ Peter Berlin (8 July 2006). "France and Italy – Settled and similar". The New York Times. Retrieved 24 January 2017. 1 2 "2010 FIFA World Cup: Ranking the Top 20 WAGs of the Soccer Elite – 16. Hayet Abidal". Bleacher Report. 24 May 2010. Retrieved 15 November 2012. ↑ "Euro 2012: Wives and girlfriends – France: Hayet & Éric Abidal". MSN. 24 April 2012. Retrieved 15 November 2012. ↑ "Femmes de footballeurs: qui sont-elles? – Hayet et Eric Abidal" [Footballers' wives: who are they? – Hayet and Eric Abidal] (in French). Elle . Retrieved 15 November 2012. ↑ "E. Abidal". Soccerway. Retrieved 2 July 2014. ↑ "Éric Abidal". EU-Football.info. Retrieved 13 January 2016. ↑ "Abidal wins Aldo Rovira Award 2011/12". FC Barcelona. 28 June 2012. Retrieved 11 May 2017. ↑ "Wall of Fame". Globe Soccer. Retrieved 28 December 2015. ↑ "Ad Abidal il Premio Facchetti – "Un'altra vita? La vorrei così"" [To Abidal the Facchetti Award – "Another life? I would want it like this"]. La Gazzetta dello Sport (in Italian). 30 October 2013. Retrieved 21 January 2015. Wikimedia Commons has media related to Éric Abidal .